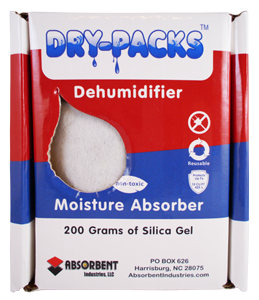 Dry-packs moisture absorbing dehumidifying boxes are made of sturdy corrugated carton. Contents 100-percent white/clear silica gel are contained within a bag that can easily be reactivated. Reactivation instructions are printed right on the side of the box. Our dry-packs moisture absorbing boxes are 100-percent cobalt chloride free with a built-in moisture indicator that changes from brown dry to pale green humid. A great tool to assist you in keeping your valuables protected.